The wait in line was not as long as it seemed. But seeing so many people like you – young, eager, and hungry – has a way of warping one’s perception of a situation. The crowd was waiting to enter Fête, a Chicago pop-up market featuring vendors of wares and food. The food part was what most enticed me and from my observations later in the evening, probably the crowd as well. Chefs from established and not-yet opened venues such as Trencherman, La Sirena Clandestina, Mott Street, and Parson’s Chicken and Fish prepared elaborate, yet portable bites for a fraction of the cost of what is normally served in their restaurants. Lines snaked around the room as customers anticipated the treats they could indulge in. It is perhaps easier to love and nurture an appreciation for food than in other capacities. My friends who are a part of this culture do not own cars or homes and make low incomes in entry-level positions. They save accordingly, live responsibly, and are generally knowledgeable about what they lack in finances. This food culture, then – the going out to eat, the elaborate meals at home – is a way for them to participate in a culture of luxury. Richness in this case derives from flavors and ingredients, even heaping amounts of fat. In some cases, they literally devour to excess. Not all of their food is over-the-top. But it is always good and through this good food they find pleasure. This burgeoning and contemporary foodie culture is a more accessible form of luxury. It would be wrong to say that it is accessible to everyone in a country (and city) that has yet to address its rising rates of hunger and food insecurity. It is a privilege of wealth and access, period. That should not be ignored or tempered by an indulgent appetite. But in the context of many young consumers like the young women I know and myself, it is easier to “buy” into what is being sold. The actual costs – say, a maple bacon donut from Glazed and Infused – are relatively low. The stakes are easier to broach. Unlike designer clothing or a luxury home, “good” food can be found high and low. 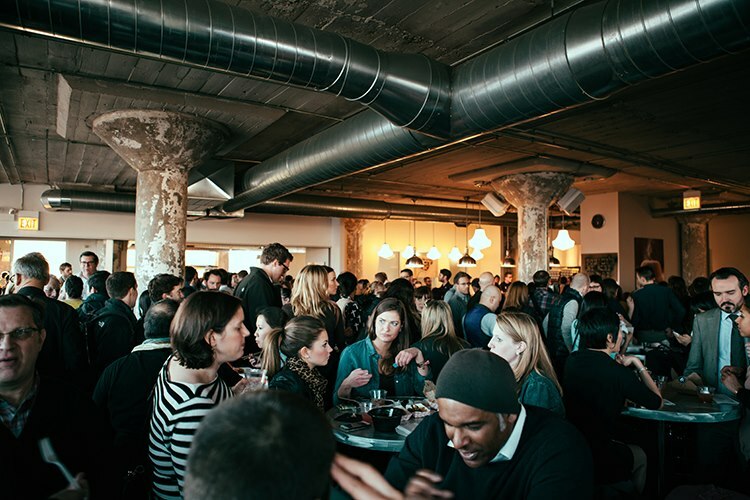 Chicago is the perfect place for foodie culture with its abundance of experimental chefs and mix of high and low establishments. The access to this world (and it is great and spans the city) can be acquired with little effort. There are pop-ups and night markets and small shops making food that hits just right. If memory is sensory then a great meal can last forever. I am reminded of the day after a powerful storm ripped through the city. The expressway was shut down for flooding. My best friend and I both lived in Oak Park at the time and as we walked to the Oak Park blue line station, we saw how the strength and force of only a few minutes of weather could debilitate whole swaths of the city. We were on our way to a pop-up restaurant at the now-defunct Logan Square Kitchen featuring eats from Bill Kim, among others. After numerous calls, rides, and transfers, we finally made it to the event. Outside on a rickety table, we ate lemongrass chicken with lettuce and hoisin barbecue sauce and bacon butterscotch and blueberry creme fraiche donuts. I remember because the food was good and cheap, totaling under $10. I photographed my food but then stopped a moment or two later. This documentation is a growing part of the rise of foodie culture, but it’s one I do not need to participate in. The journey to the space and the experience itself was enough.